You didn't murder 12 people in Paris today because of religion. 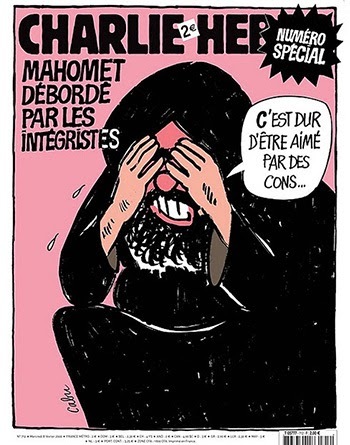 Not to punish magazine cartoonists for mocking your God. Certainly not because your God needs to be defended from those who mock him. You didn't appoint yourselves judge, jury, and executioners of innocent people to make a statement about the superiority of your beliefs, or about the mortal peril of disagreeing with those beliefs. Although you may think you were sending a message to those who resist your interpretation of "truth," I'm here to tell you that the message we have received is quite different. You may think you're imposing your vision on a world full of infidels, when in fact you're blind. You're not zealots. You're bullies. In your black hearts, you don't care what anybody believes, as long as they don't disagree with you. You have no faith, only the need to be right. If Mohammed were choking on on olive pit, and you had a choice to save him or to have people kowtow to you, Mohammed would be dead and you'd be fist-bumping each other because you'd won the fear game. I'm not disrespecting your religion. I don't give a damn about your religion. Good for each of you if you want to be a good person. If you want to be Kings of What Is Good, then I've got news for you: You've failed. Killing people means you've failed. "100 lashes if you don't die of laughter!" 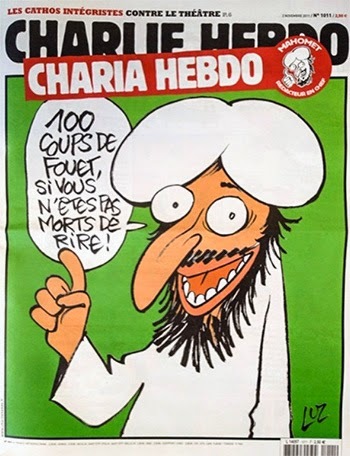 Now you've murdered 12 people - four of them cartoonists and two of them police officers. Not because you're devout. Not because you're righteous. Just because you're mean, angry, violent, power-hungry thugs. Probably your penises are extremely small, but I'm trying to stay on point here. The world is coming together in outrage and grief over your pointless rampage. Judging from the universal condemnation of your mindless, soulless attack, it would seem that most people believe the most fundamental of human rights is not to worship an arbitrary God to the exclusion of compassion, but to be able to express ourselves, freely and without fear. If you're keeping score, that makes you the losers in the battle of who's right. "It's hard to be loved by idiots." Your God is not worth the 12 lives you took today. And your crusade isn't worth the paper on which they printed their silly, meaningless cartoons. You go on and believe in whatever god or prophet or goatherder you please. You go right ahead and think people who don't share your beliefs are damned. But for Allah's sake, get a thicker skin, you whiners. And grow a pair. Not just because you need to man up, but because maybe if you get laid you'll relax a little. And a lot more where I came from.